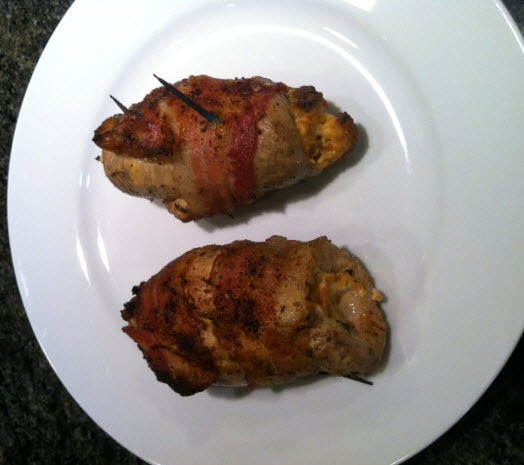 Here’s another great recipe to grill up when you are entertaining guests. It’s fairly simple and can be prepared – up to the grilling part – ahead of time. It’s also a great use for leftovers from yesterday’s crawfish boil. The base of the stuffing is cream cheese, but anything can be substituted for or added with the crawfish, such as shrimp, crab, sausage, mushrooms, spinach or other vegetables. I rarely name brands, but the Saute Express is a real flavor adder and I believe worth trying. This recipe could also be cooked in your oven. I have not tried this so I can’t give specifics. I’d try 20 -30 minutes at 375 – 400 degrees and broil for the last five minutes. Ahead of time set out the cream cheese to allow it to soften at room temp. Partially cook the bacon until it’s limp and set aside. I cheated and did it in the microwave for two minutes. Melt the Sauté Express in a skillet then add the crawfish tails. Stir for a couple of minutes then add the creamed cheese. Once the cream cheese has melted and combined with the crawfish, stir in the green onions and set aside. You want this to cool enough to jell so it’s easier to use as a stuffing. Flatten out the chicken breast until they are about ¼” thick. (I cheated and bought thin sliced chicken breast.) Season the chicken breast with Creole Seasoning. Spoon the stuffing mixture into the center of the breast and roll it up. I used about two tablespoons on each. Use just enough so it’s not squirting out and making a mess. You’ll get the hang of this on about the 8th one. Next roll the bacon around the outside of the breast and secure with two toothpicks. Cook on a hot charcoal or gas grill. I took mine off when they reached 165 degrees.